It all began late one night when my bother and I were mindlessly channeling surfing. I was sitting in a chair while my brother laid on the couch. Click, click, click. There was just nothing on the TV that grabbed our attention. It was either because everything on TV was crap or that we lost all interest in what we were doing. Just then, I happened the land on channel 90, G4 TV. We sat up immediately and leaned forward with a curiosity normally reserved for more brain-building activities than watching TV. Am I really seeing this? What’s going on – there’s so much happening? The colours, the fluid animation… and the blood! I couldn’t believe that something so disturbingly graphic – yet cleverly thought out– was being shown on the television. So what is this Superjail? Man, it’s hard for me to fully explain what the hell it is. The animation style segues smoothly from scene to scene, with a train of thought and brutally gory violence like that of a hallucinatory drug (without side-effects.) The plot of each episode may not be overly complicated, but the opposite is true for the animation. The humor on the other hand is perverse and sometimes, if not a lot of the time, down-right appalling. 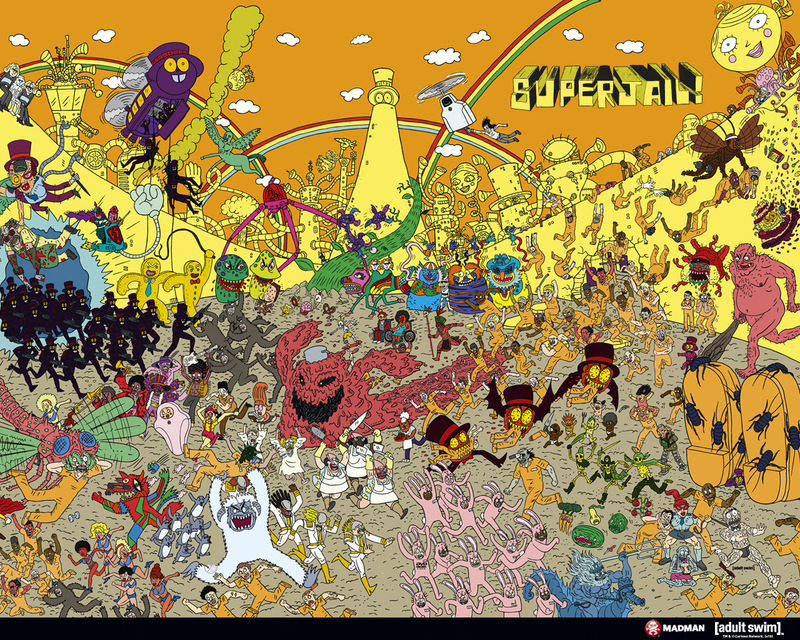 The pace of Superjail is perfect; it has the right amount of manic battle scenes, mixed with steady rests allowing for a pleasing unraveling of the plot. Sure, you could watch the show’s hysterically deranged action for the full 11 minute run-time, but trust me: your eyes, and most definitely your mind, will need a break. My brother and I were astounded to stumble upon this intergalactic freak show. Finding this quenching entertainment was like finding water in a desert of poor programming. It was like finding God – or at least several gods in the creators of the show bringing to life such a glorious monstrosity. If you enjoy oddly maniacal trains of thought that jump tracks and that border on the absurd, and fantastical visuals with hallucinogenic qualities, then I urge you watch this sensory bending cartoon. If not… well, then stick to the Care Bears.